In 1902, The Sun, a New York newspaper that frequently found space within its columns for aspects of the convivial life, published what they claimed was a true transcript of a monologue delivered in a Washington, D.C., bar by an officer of the United States Navy who had seen much of the world. Its subject was the cocktail—its present state, where it flourished, where it did not. After pronouncing the cocktails in Yokohama “vile,” those in Beijing “extremely potable” and opining that “the only place in Europe where a decent cocktail may be had” is Nice, he turns his judgment to the United States. Some cities—Washington, Cincinnati, Philadelphia—have good cocktails. “If you want a bad cocktail,” though, “it may be had in Kansas City”; New Orleans and St. Louis aren’t much better. Chicago cocktails are sloppy, New York ones dangerous. Then there’s Boston. “Boston does not drink many cocktails, but they seem to be carefully compounded,” the Navy man opined. And yet Boston does “little to advance the interests of the Empire.” Now, I’m not 100 percent sure what the old salt meant by that last bit, but since he began his harangue with the thesis that the cocktail had done more than anything to advance American influence in the world, one may conclude that he felt that somehow Boston wasn’t quite pulling its weight. He wasn’t wrong. Page through the annals of cocktail history up to the time our naval officer was speaking, and you’ll be hard-pressed to find any distinctive contribution to the art that is Boston’s and Boston’s alone. A good, solid drinking town, to be sure, and one that could boast of a pair of iconic bars, the venerable one at the Parker House, and the even more venerable one across the street at the Tremont House, where Dickens first encountered the American way of drinking back in 1843. And Boston did contribute the coil-rimmed “Hawthorne” strainer, named after the downtown saloon that held the patent and marketed the device. It just couldn’t seem to come up with a signature drink, a cocktail that characterized it like the Manhattan did New York, the Sazerac New Orleans, the Pisco Punch San Francisco and the Rickey Washington. 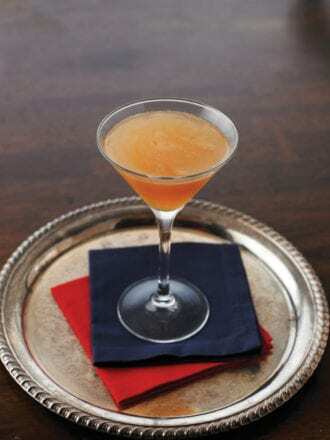 Throughout the 1880s and 1890s, when most of the cocktail-creating was going on elsewhere, all Boston had to offer was the Worthington Cocktail, a drink that was current only so long as The Boston Globe promoted it (it was named after the Prohibition-friendly editor of a rival paper) and whose formula has not been preserved. That, at least, was how things stood in 1902. But all things flow, as Heraclitus maintained, and Boston among them. In 1906, one Amy Lyman Phillips published a book there titled A Bachelor’s Cupboard. In her useful chapter on bachelor’s drinks, Ms. Phillips noted that grenadine “is used notably in the concoction of the ‘Ward Eight’ of Boston’s Winter Place Hotel, perhaps better known locally as ‘Frank Locke’s.’ ” This is the first notice we have of the Ward 8 (as it’s usually written). This grenadine-sweetened take on the Whiskey Sour would rapidly become Boston’s answer to the cocktail conundrum, and almost as rapidly pose a pair of conundrums of its own. The first puzzler is a cocktail perennial—the circumstances of its birth. Modern myth states that the Ward 8 was created in 1898 by bartender Tom Hussion at Locke-Ober (as the Winter Place Hotel became known) to celebrate an election won by Martin “The Mahatma” Lomasney, political boss of North Boston. But this story, which can be traced back to a 1951 article in Holiday magazine, isn’t the only one. A 1936 letter to The Sun claims it for bartender Charlie Carter at Lomasney’s Puritan Club in 1903, while a 1940 book returns the drink to Locke-Ober, but awards it to one Billy Kane, without a date. All three stories have elements of plausibility (although Hussion didn’t start work at Locke-Ober until 1900). We may never know. The other question is how you make the damn thing. Dozens of recipes survive from the 1920s and ’30s, with an unusual amount of disagreement. The one here, however, covers most of the things in which they do agree and has the advantage of being light, lively and ridiculously easy to drink. If that won’t advance the interests of the Empire, I don’t know what will. Take your shakerato to the next level with a shot of limoncello, sambuca or amaretto.